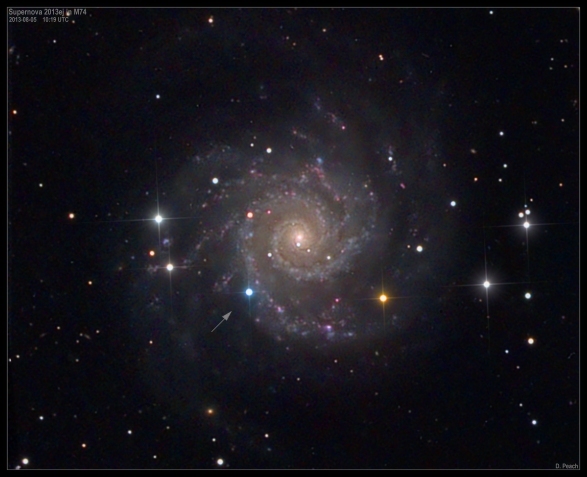 In this section you'll find images of some of the most energetic events that occur in the universe, At any one time there are often many Supernovae within reach of amateur telescopes and many are discovered by amateurs. Below you'll find images of such events both past and present. All dates can be found in the file names themselves and on the images. 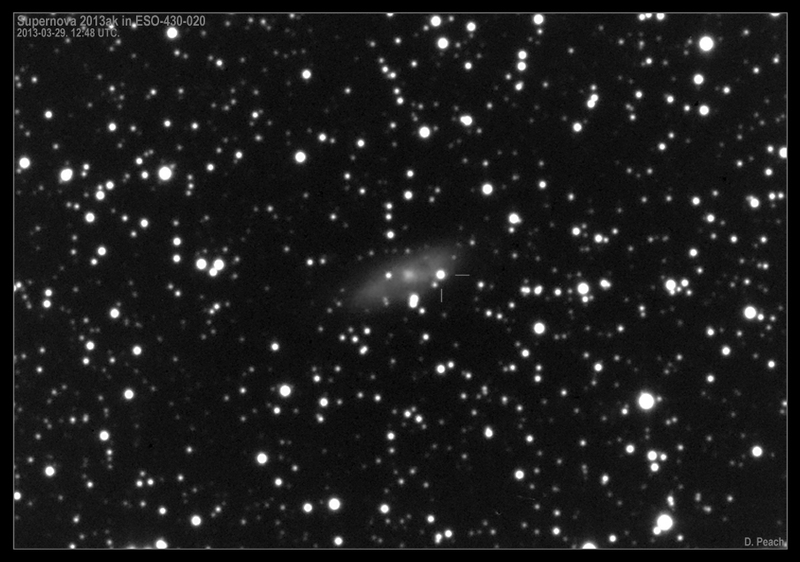 Supernova 2017ein in NGC 3938 24"CDK with FLI camera. LRGB image. 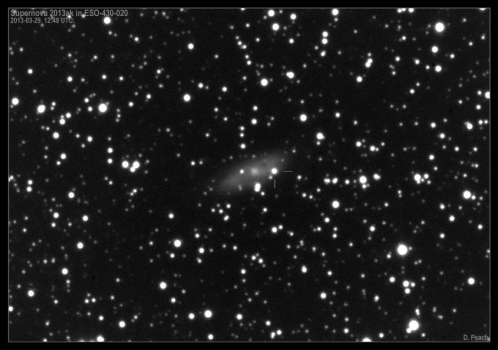 Supernova 2017eaw in NGC 6946 24"CDK with FLI camera. 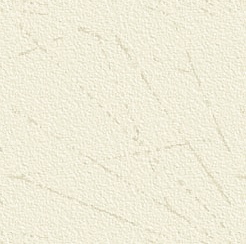 LRGB image. 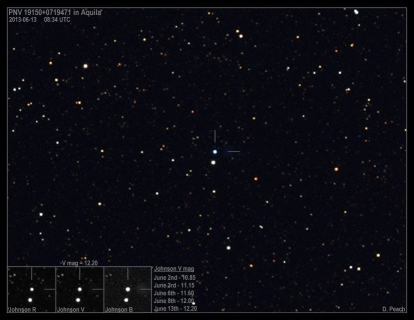 Supernova AT 2016adi in NGC 5292 27"CDK with FLI camera. Unfiltered image. 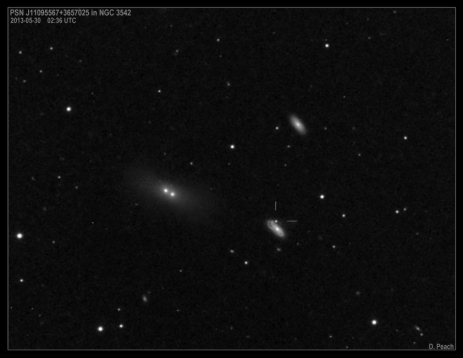 Supernova AT 2016adj in NGC 5128 20" CDK@F4.5. FLI camera. LRGB image. Nova Delphini 2013 20"CDK@F/4.5. FLI-PL6303E camera. RVB image. August 18th, 2013. Nova Delphini 2013. 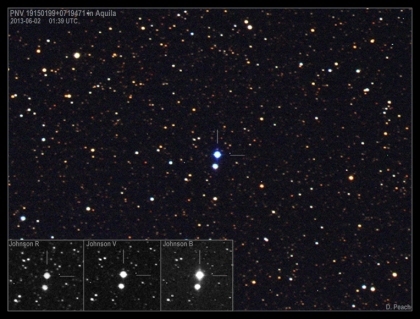 This new bright nova discovered on August 14th is the brightest seen since 2007. It is easily visible in binoculars and still perhaps just within naked eye visibility from very dark sites though is fading. 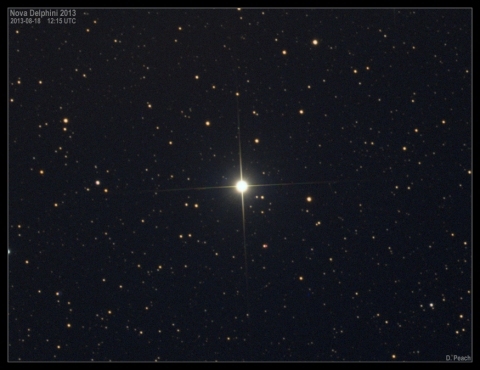 Although it appears as a single star its actually a binary system and the massive outburst in brightness is the result of material being drawn off a larger giant star onto a dense white dwarf companion which builds up until a massive explosion occurs - in this case resulting in a 25000 fold increase in brightness! 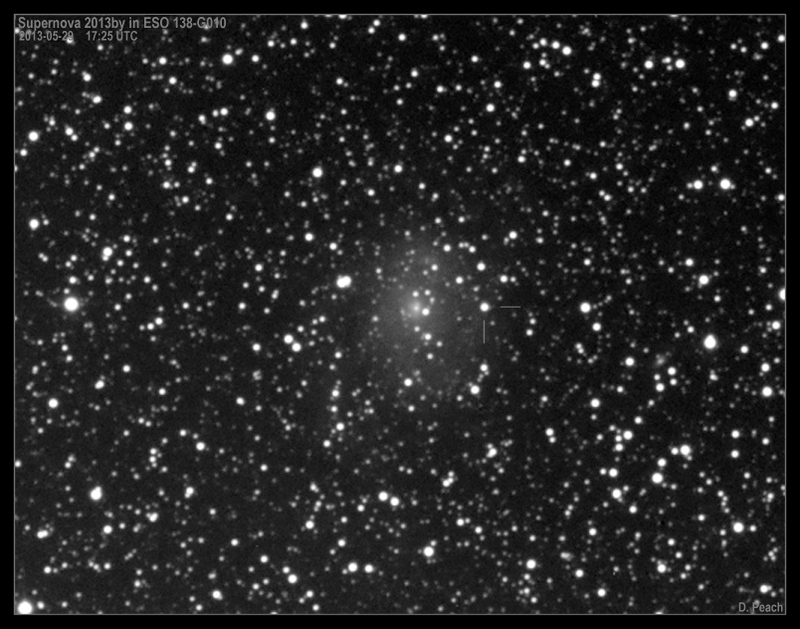 Supernova 2013ej in M74 20"CDK@F/4.5. FLI-PL6303E camera. LRGB. L:24mins. RGB: 3mins. July 31st and August 5th, 2013. 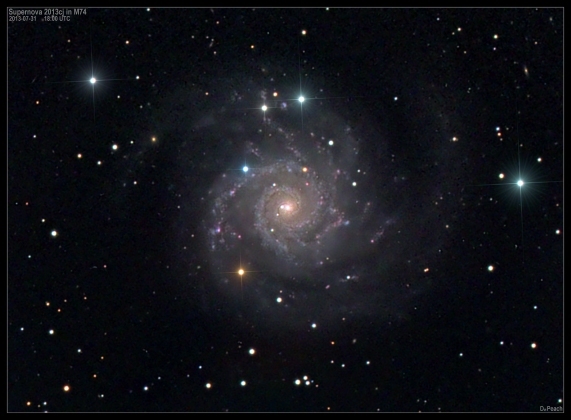 Bright supernova in spiral galaxy M74 in Pisces. Discovered on July 25th by the LOSS. 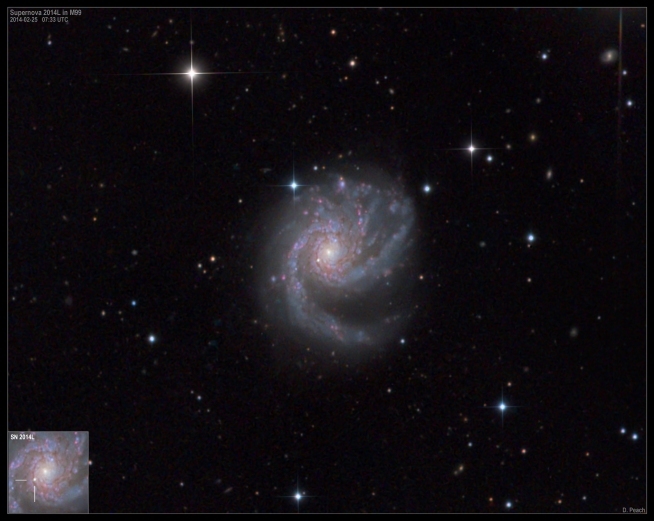 This 12th magnitude supernova is an easy object in modest size telescopes, M74 is a well known spiral galaxy 32 million light years away in the constellation Pisces. 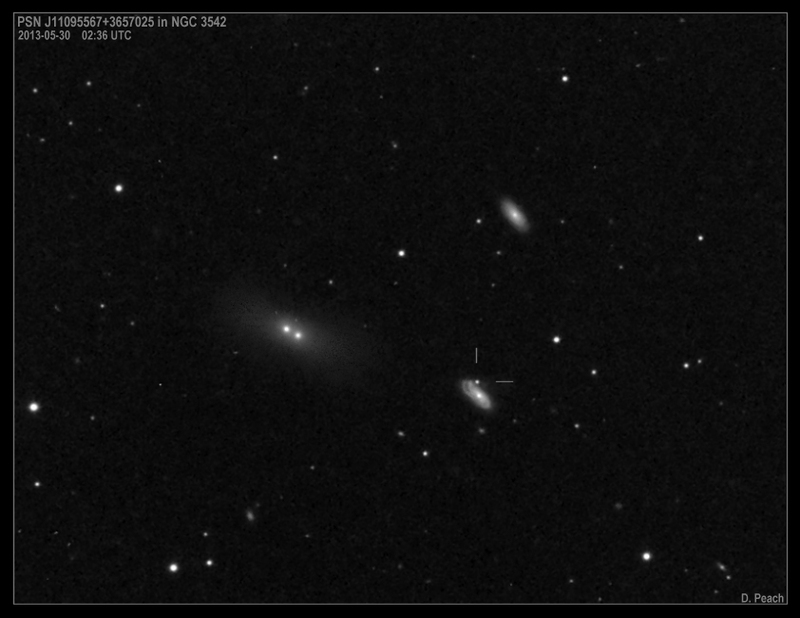 Supernova 2013dc in NGC 6240 17"CDK@F/4.5. FLI-PL6303E camera. LRGB. L:10mins. RGB: 2mins. June 3rd, 2013. Supernova in peculiar galaxy NGC 6240. 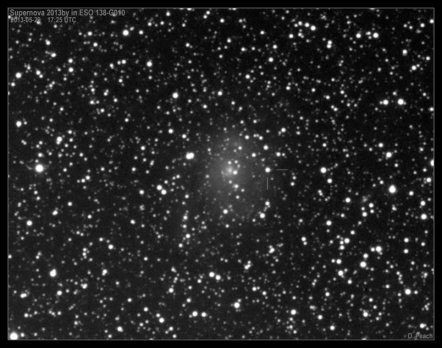 Discovered by Adam Block on April 11th. Its still present though must be around 18th to 19th magnitude. This peculiar galaxy is the result of a merger between galaxies resulting in this chaotic appearance. The galaxy itself is 400 million light years away in the constellation Ophiuchus and glows fairly dimly at 14th magnitude. 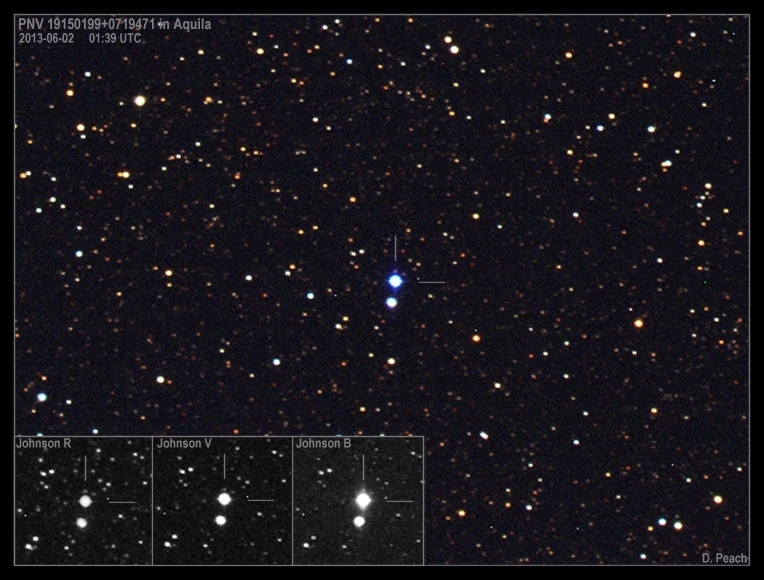 Nova in Aquila 17"CDK@F/6.8. STL-11000M camera. 1x2mins with Johnson RVB filters..June 2013. 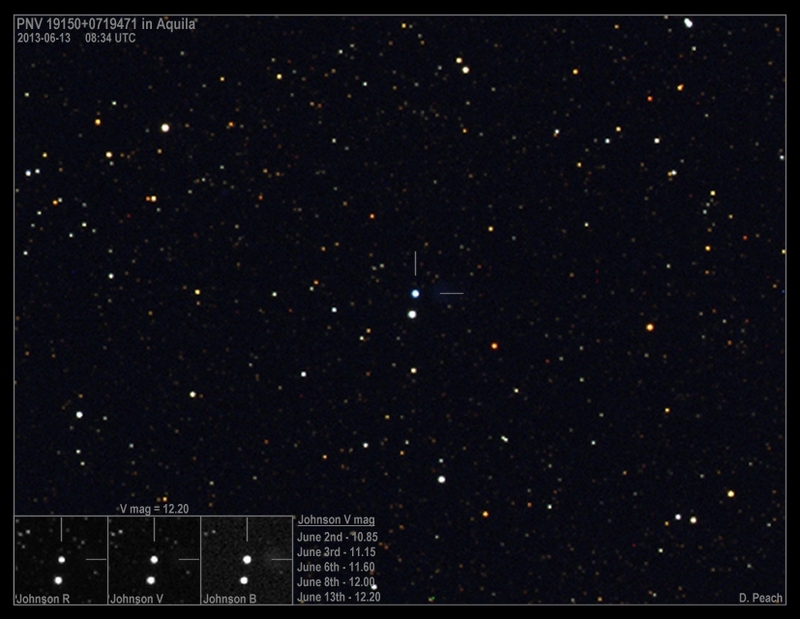 Discovered on May 31st, 2013 this new 11th mag nova suspect is easily visible in small telescopes presently displaying a notable blue colouration. It is thought to be a dward novae of the WZ Sagittae type. Possible Supernova in galaxy NGC 3542 17"CDK@F/4.5. FLI-PL6303E camera. 4x3mins unfiltered. At the time of this image this supernova suspect remains unconfirmed via spectra. Discovered by British observer Ron Arbour it is located in NGC 3542, a remote spiral galaxy in the constellation of Ursa Major. 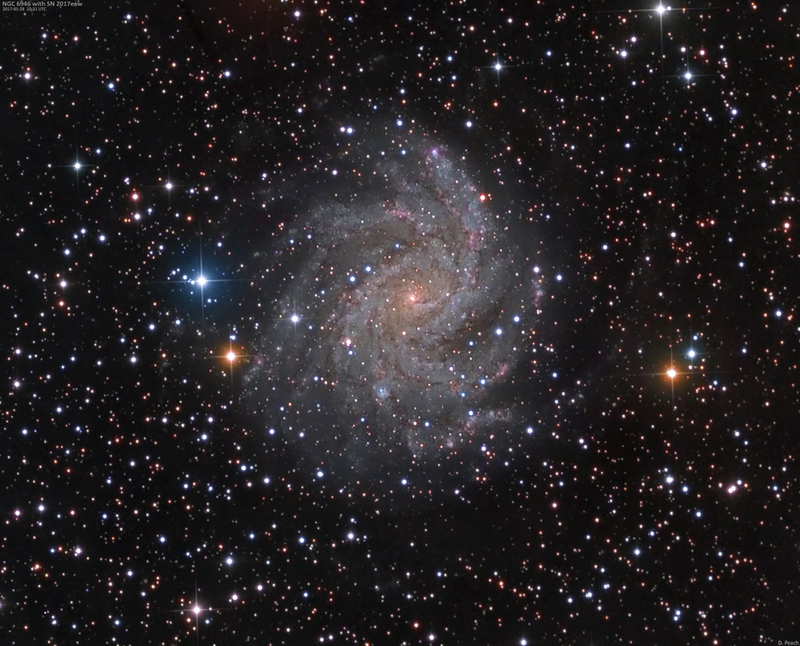 The galaxy itself is 400 million ly away and the supernova itself around 17th magnitude. 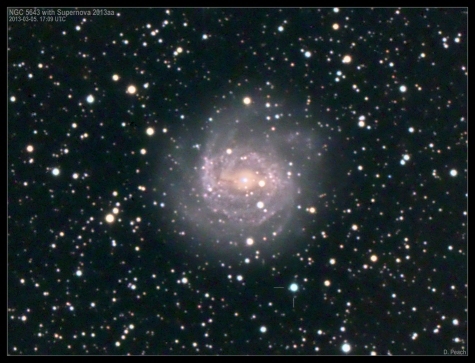 Supernova 2013by in galaxy ESO 138-G010 20"CDK@F/4.5. FLI-PL6303E camera. 4x3mins unfiltered. 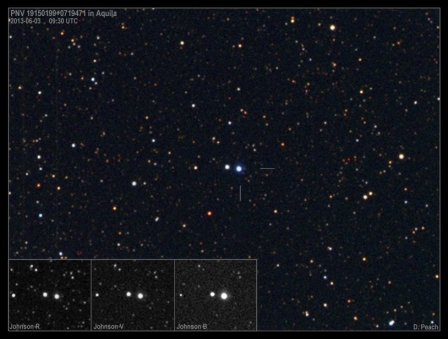 Located in the constellation Ara this Supernova is quite bright at the moment at magnitude 13 meaning it is visible in a 20cm telescope in good conditions. 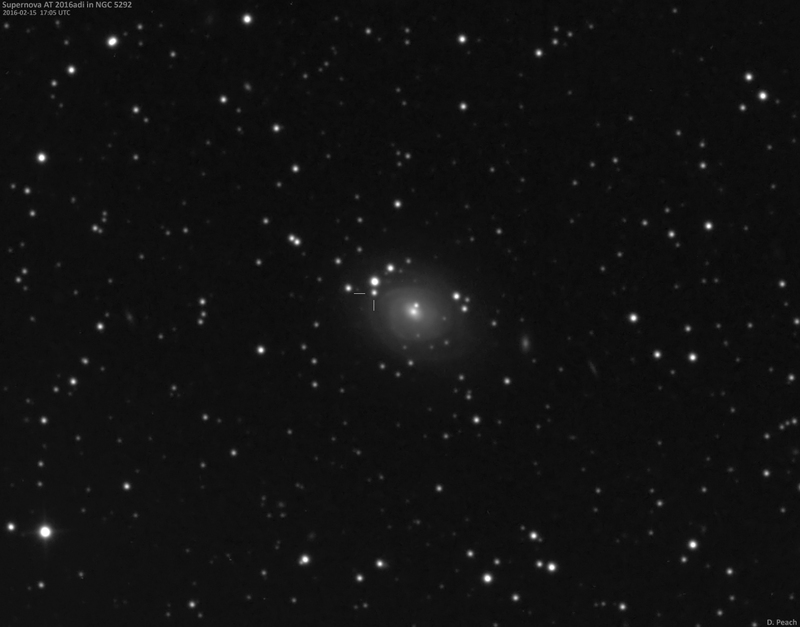 The galaxy itself is quite faint around 15th magnitude and lays in a rich star field. The galaxy itself appears to be a face on spiral galaxy of 11th magnitude 24 million ly away. 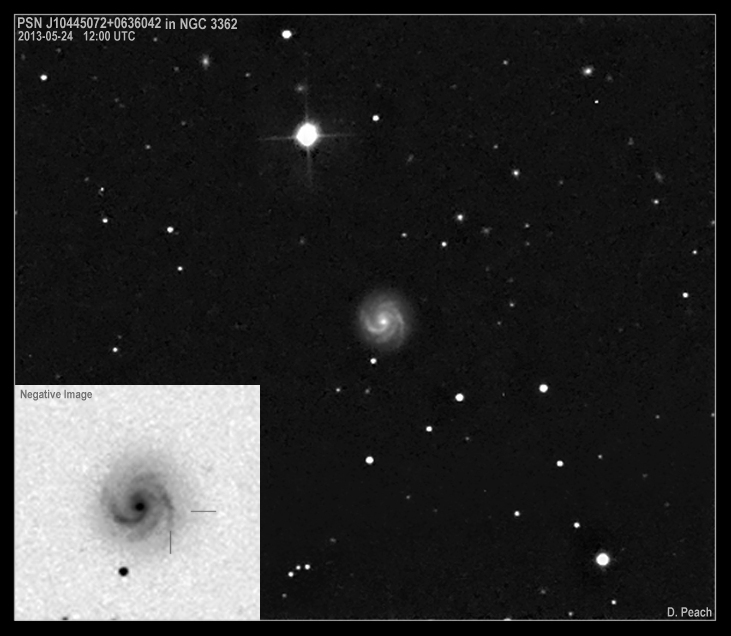 Possible Supernova in galaxy NGC 3362 17"CDK@F/4.5. FLI-PL6303E camera. 4x3mins unfiltered. Another supernova suspect that remains unconfirmed via spectra. This one however is very faint at 20th magnitude and barely detected. 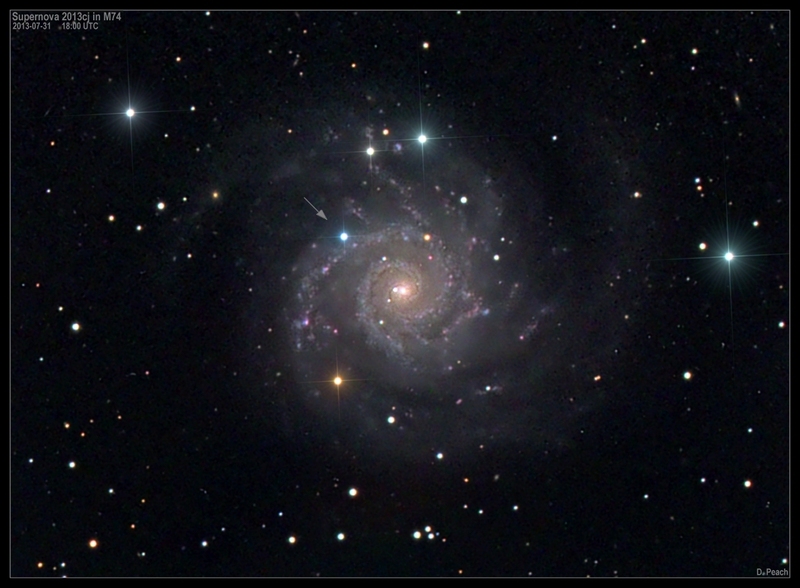 NGC 3362 is a distant spiral galaxy 360 million ly away in the constellation Leo. 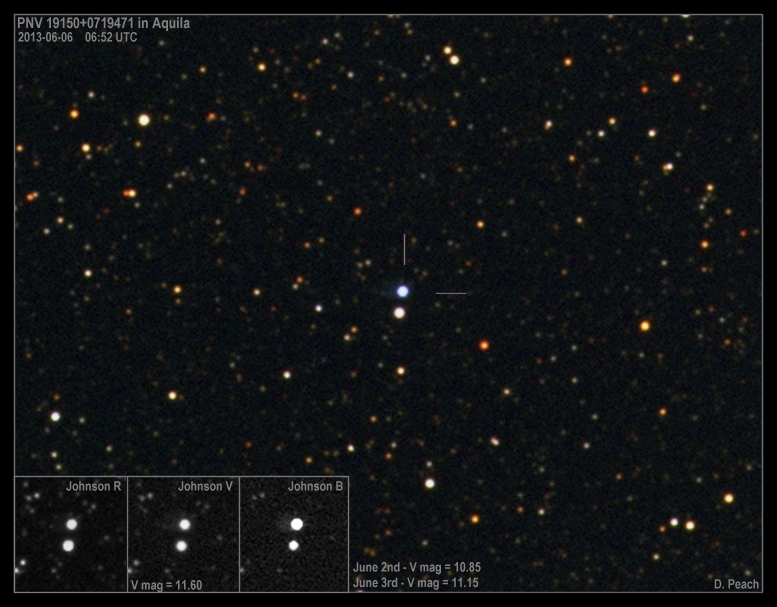 Supernova 2013ak in galaxy ESO 430-020 20"CDK@F/4.5. FLI-PL6303E camera. 4x3mins unfiltered. Near full moon present 90deg away. 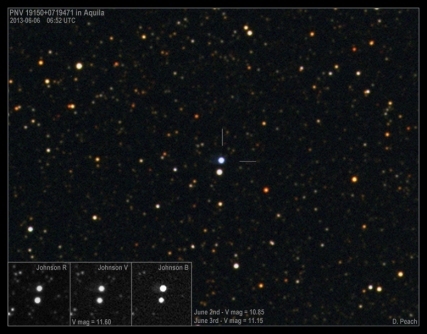 Located in the constellation Puppis this Supernova is quite bright at the moment at magnitude 14 meaning it is visible in a 25cm telescope in good conditions. 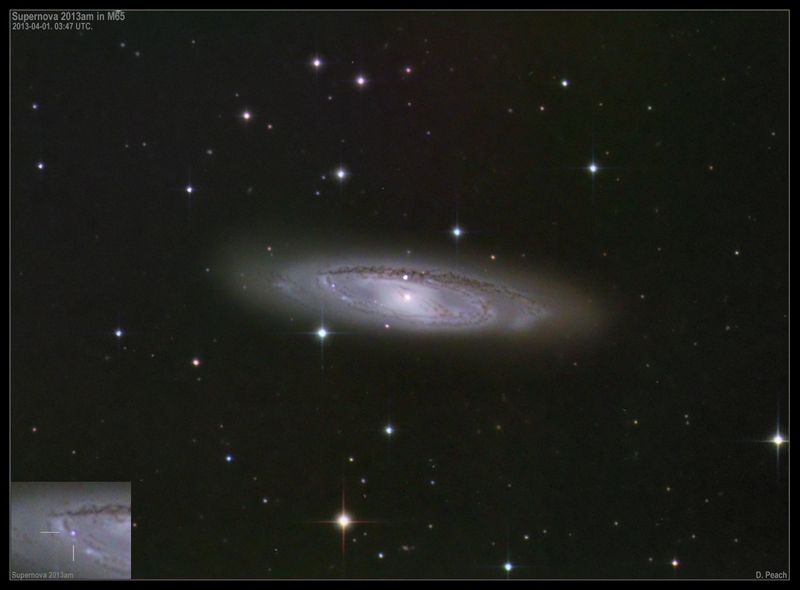 The galaxy itself is quite faint around 15th magnitude and appears to be a spiral galaxy viewed at an oblique angle. Supernova 2013am in Messier 65. 17" CDK@F4.5. FLI camera. L:20mins. RGB: 5mins. April 1st, 2013. 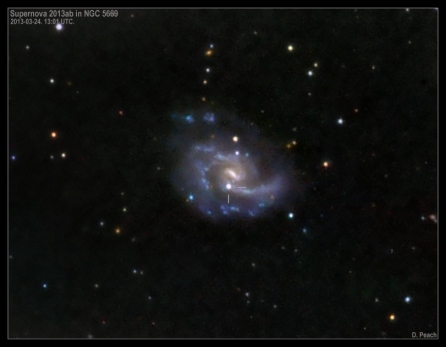 Supernova 2013ab in NGC 5669. 20" CDK@F4.5. FLI camera. L:10mins. RGB: 3mins. Bright moon nearby. March 24th,2013. 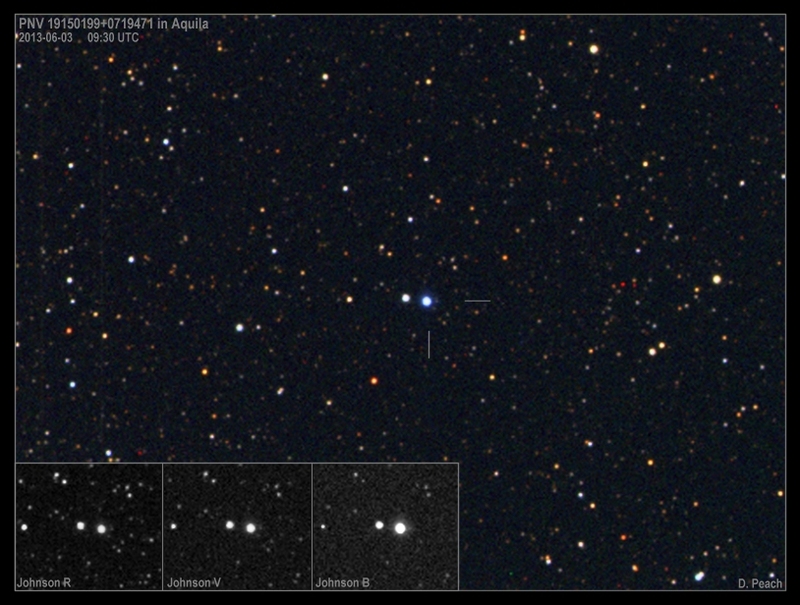 This fairly bright supernova was discovered back on February 17th by the Lick Observatory Supernova Search. 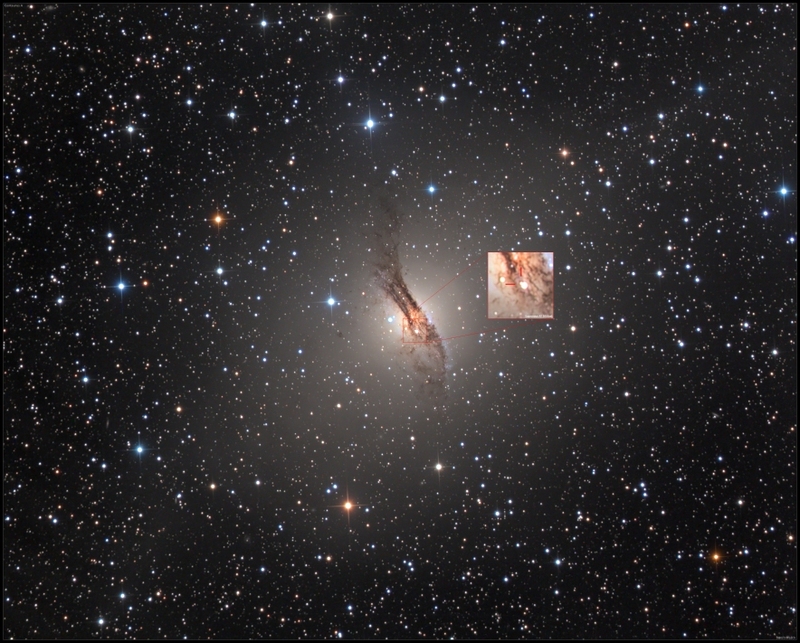 In the above image it appears as a 15th magnitude star just below the galaxy nucleus. 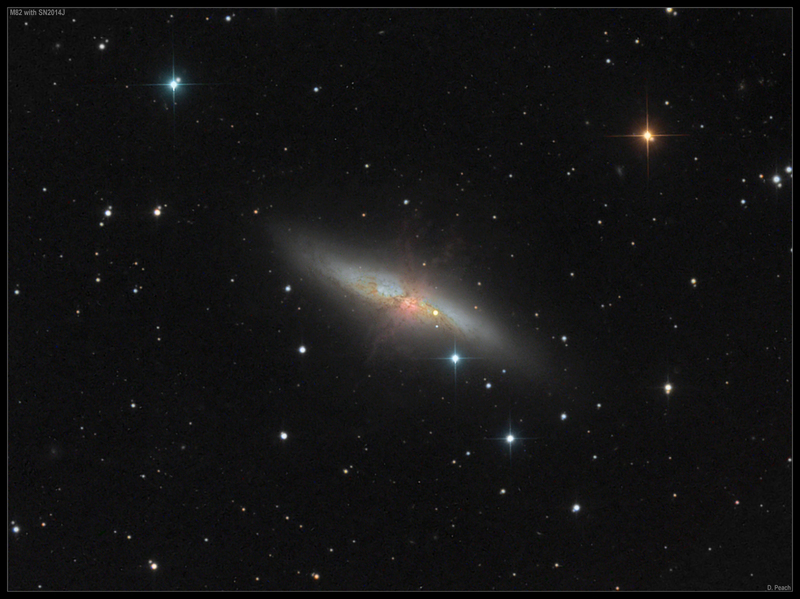 NGC 5669 is around 60 million light years away and located in Bootes. 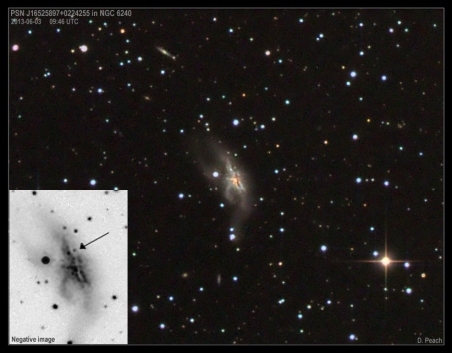 Supernova 2013aa in NGC 5643. 20" CDK@F4.5. FLI camera. L:10mins. RGB: 3mins. March 2013. Supernova 2013aa (marked with cross hairs) in galaxy NGC5643. 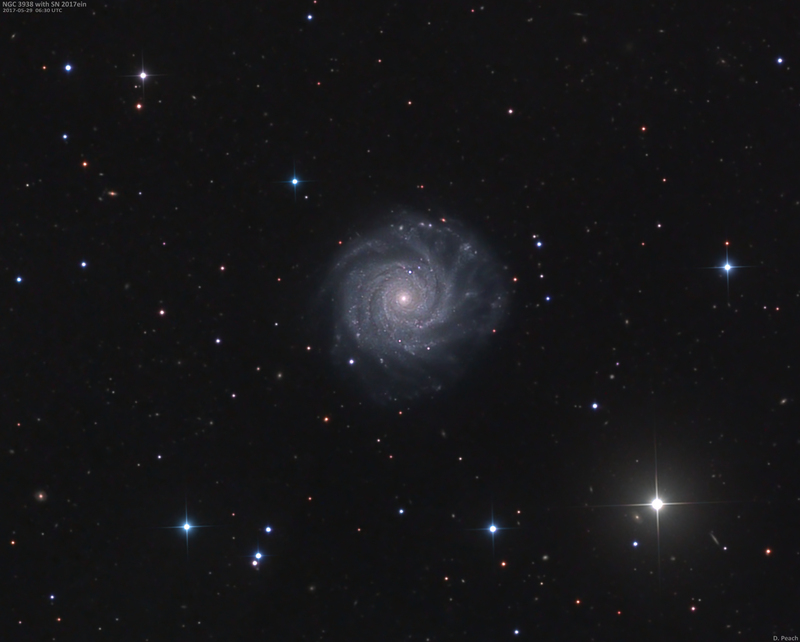 This spiral galaxy is 34 million light years away in the constellation Lupus. This new star appeared last month and although being incredibly distant it can be seen even in small telescopes. This supernova is the fifth brightest to have been seen since supernova 1987A in the Large Magellanic Cloud.